Description of "Inclusive Development of Odisha | Vol 1"
The book is divided into three sections which includes towards building economic inclusiveness (access to land, forest, water, credit, budget, wage, and employment, social security and basic services) strengthen inclusive governance and towards social inclusion these three are interconnected and very much require for inclusive development of Odisha. We hope this book will be used as an instrument in the realisation of the basic rights of the marginalised in Odisha by strengthening people’s movements and struggles and contribute to the process of building of an inclusive, democratic and vibrant Odisha. Manas Jena, rights based activist, researcher and a democratic voice of Odisha. He has studied major issues affecting common people and he has been strongly advocating for the people's right based on the constitutional mandate of the state. 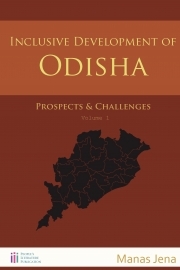 Reviews of "Inclusive Development of Odisha | Vol 1"